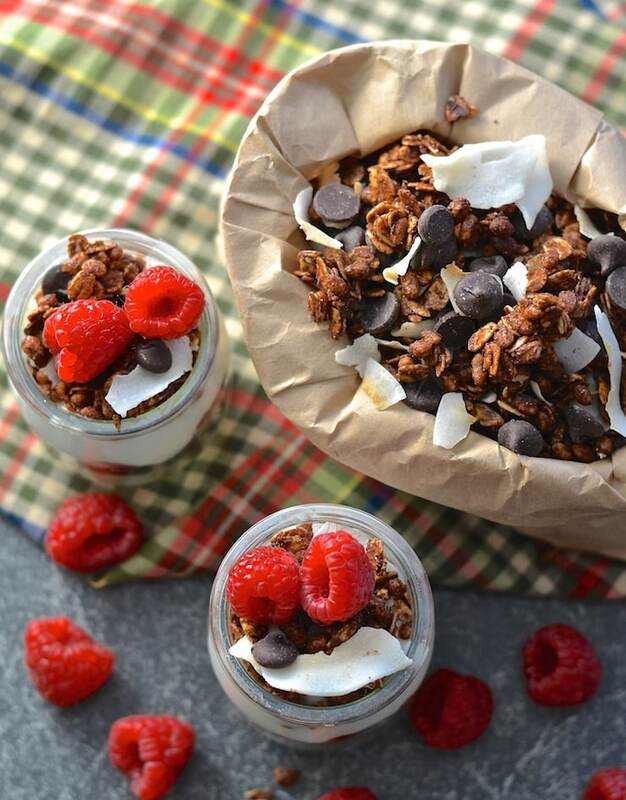 This is the ultimate double chocolate coconut vegan granola recipe. Crunchy, chewy, chocolatey, coconutty, not too sweet, very slightly salty…..Just perfect! Can you tell I’m excited? I mean it’s got chocolate on/in it so it’s gotta be good, right? It’s no secret that I love granola. 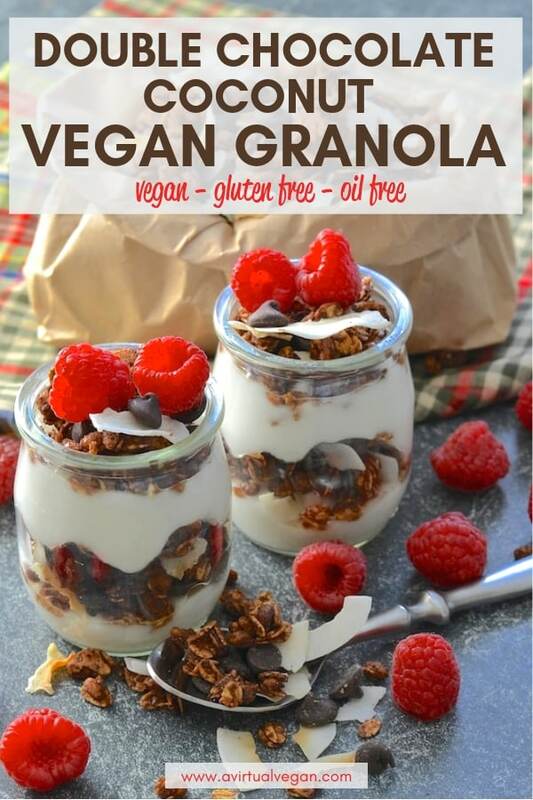 Have you tried my Vegan Almond Hemp Granola? It’s so good! And I’ve had this new granola under my hat (not literally…that would just be weird) for ages. As I said when I published my Chocolate Tahini Crunch Bars, I have a bit of a chocolate obsession and if I let this obsession take hold, everything on this blog would be chocolate coated. That would be even weirder…. So, I control myself for the sake of normality (and my waistline) and try to space out my chocolate recipes. It’s actually been three weeks since I published a chocolatey recipe and I literally could not wait any longer. 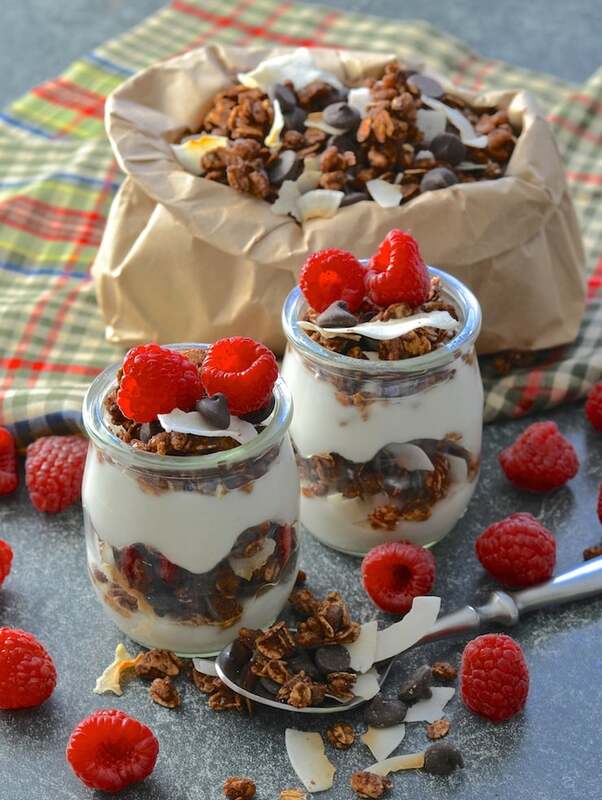 This Double Chocolate Coconut Vegan Granola recipe is the bomb. It is so good. Every-time I make it I make a double batch and it disappears within days. My husband has his hand in the granola jar every-time he enters the kitchen and, if I am honest, I do too. It is so extremely easy to make. All you need are a few minutes of your time to mix it all up plus fifteen minutes to bake it. Keep it in an airtight container and it lasts for a few weeks….Ha ha! Who am I kidding? I honestly have no idea how long it lasts. There is no way we could have a jar of this taunting us from the kitchen for weeks. When I say it lasts for a few weeks I am going by other granolas which I have made in the past. I am sure that this one will too, but can virtually guarantee that you will never find out because it quite simply will not be around long enough. This granola is great as a quick snack by the handful or with smoothie bowls. Try it with my Healthy Chocolate Smoothie. It is also awesome with yogurt. I personally haven’t had much luck with yogurt since becoming vegan. I have tried so many kinds and not been happy with them. That is until I found Amande yogurt. 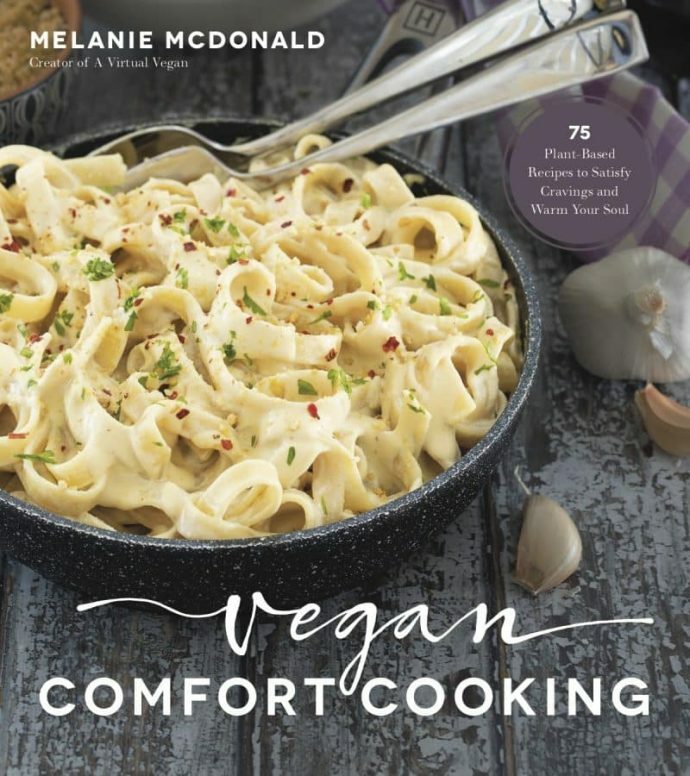 It is absolutely delicious and is very dairy-like but made from almonds. It also has no artificial ingredients or preservatives, it is gluten-free, non-GMO & the flavoured varieties are naturally sweetened with fruit juice. 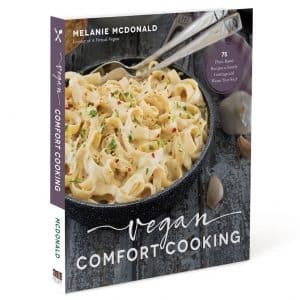 I love it and have been eating my Double Chocolate Coconut Vegan Granola with it regularly. 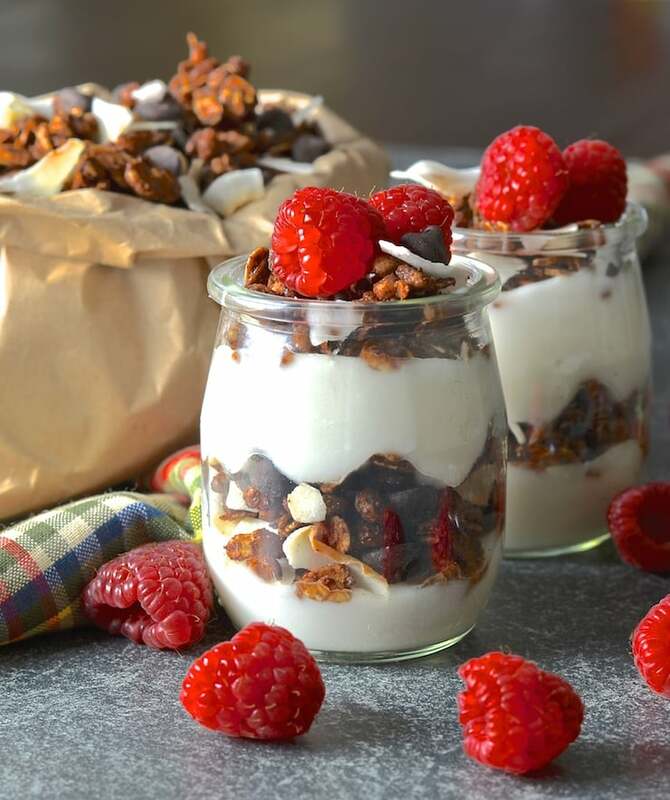 Scattered with a few raspberries, it is breakfast perfection. No, Amande have not contacted me and asked me to say this, nor are they sponsoring my post. I just love the product, think it’s a great match for my Double Chocolate Coconut Vegan Granola and wanted to share it with you. If you make my granola, do me a favour and tag me on Instagram @avirtualvegan or use the hashtag #avirtualvegan . 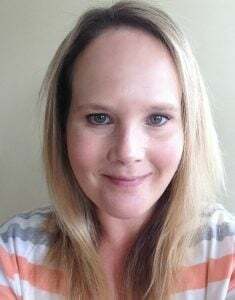 I would love to see! If you love granola you might also enjoy my Cherry Almond Granola Bars or my Pumpkin Granola Bars with Pecans & Chocolate. Preheat oven to 325°F and line a large baking sheet with parchment paper or a silicone mat . Add the oats, puffed rice, cocoa powder to a large bowl. Stir well. Add the coconut butter, brown rice syrup, maple syrup and salt to a small pan and warm gently until liquid. Pour the liquid into the oat mixture. Pour out oaty mixture onto your prepared tray and bake for 10 minutes. Remove from the oven, stir it around a bit then return to the oven for 4 - 5 minutes. Throw on the coconut flakes and cook again for 2 minutes. Remove from oven and allow to cook on the tray. Once cool sprinkle over the chocolate chips and transfer to an air tight container. Rice syrup ensures your granola has just the right amount of chewiness. If you don't have any or can't find it in the store you can sub it for more maple syrup. It won't have quite the same amount of chewiness but it will still taste great. This wouldn’t last an afternoon with me! But it would be an _awesome_ afternoon. Ha ha! It sure would! Yum yum yum, homemade granola is the best :) Love that this uses coconut butter instead of coconut oil – will have to try that next time! Thanks Donna. Coconut butter is great in granola..especially with chocolate! Looks amazing, one of the best granola photos I have seen so far. What a delicious treat! Oh wow thank you Michelle. That means a lot as I really struggled with the photos for this recipe. Granola is hard to make look pretty, hence the addition of parfaits! This looks so good! 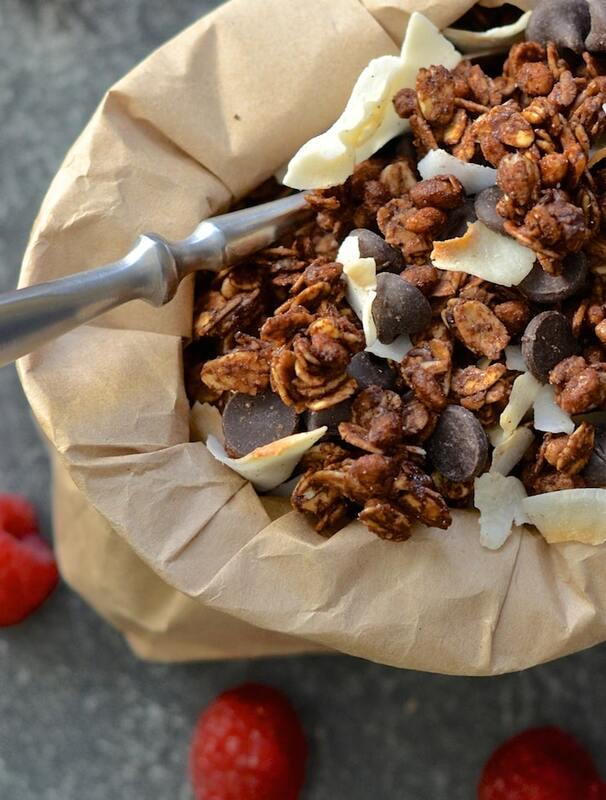 Chocolate granola is the best! And I love the parfait style! You’re excited?? I’m excited for these! They look delicious! So wish I had this for breakfast this morning. I need to make another batch of granola and this sounds delicious! Thank you Anjali! You should try it. You will love it! I agree and it’s so easy to make yourself. Even better! These absolutely look dangerous to have in the house. So many great flavors. Must try! 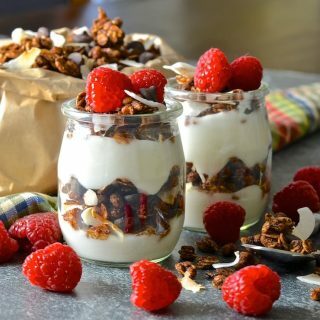 I’ve been wanting to make a a chocolate granola for a while–I’ll definitely try your recipe–Pinned!